Winner of the 2014 Irish Healthcare Award for the Best Patient Organisation Project of the Year! Walking is an ideal exercise for Lung Fibrosis patients. The 2000 Steps a Day Challenge has been specifically designed for Lung Fibrosis patients. This challenge aims to help you achieve your best level of fitness and well being while taking into account your limitations and oxygen requirements. The 2000 Steps a Day Challenge was devised by Ms. Irene Byrne, Senior Physiotherapist with the Heart and Lung Transplant Unit at the Mater University Hospital Dublin and developed with the ILFA. We hope that you will enjoy this exercise challenge and it will motivate you to incorporate an extra 2000 steps into your daily routine. We want you to use the programme to help kick start, improve and maintain your level of fitness. 1) The 2000 Steps a Day leaflet that explains the benefits of walking for Lung Fibrosis patients and gives tips and advice on how to get started and stay safe. Click here to read the Get Moving with ILFA 2000 Steps a Day Challenge leaflet. 2) An inspirational poem called “Promises to Yourself” by Christian D. Larson and a Contract for Success for you to sign and commit to the 2000 Steps a Day Challenge. 3) A pedometer (step counter) to estimate the number of steps you take, the distance travelled (miles and kilometres) and the number of calories used when walking. 4) A high visibility reflector vest to help keep you and your walking companion safe while out walking. The reflector vests have been kindly supplied to ILFA by the Road Safety Authority. 5) An exercise diary to record your progress with the 2000 Steps a Day Challenge. 7) A Donation card if you would like to make a donation to ILFA. 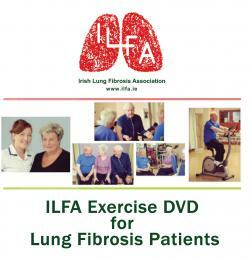 ILFA has developed a Home Exercise DVD for Lung Fibrosis Patients in collaborration with the physiotherapy department at the Mater Misericordiae Hospital, Dublin. The DVD describes different stretches and exercises to help keep you mobile, strong and fit and also covers breathing techniques, patient experiences and words of encouragement. Please contact ILFA by calling 086 871 5264 or emailing info@ilfa.ie to order your copy. 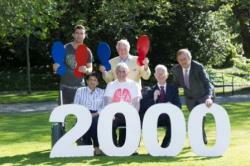 The ILFA 2000 steps a Day Challenge for Lung Fibrosis Patients was officially launched on June 5th with a photo call starring Senator Feargal Quinn (ILFA patron), Michael Darragh MacAuley (Dublin GAA star), Irene Byrne (Senior Physiotherapist at the Mater Hospital), Terence Moran (ILFA Chairman) and IPF patients Eileen O’Sullivan, Frank Tierney and Paddy O’Mahony. Eddie Cassidy and Nicola Cassidy from ILFA were also in attendance. 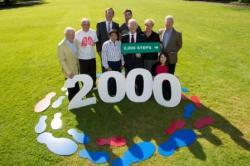 The idea for the 2000 Steps programme for Lung Fibrosis patients was based on an original idea from Irene Byrne. Together with ILFA, the exercise challenge specifically designed for Lung Fibrosis patients was developed and subsequently put to the test by a group of very eager and obliging patients from across Ireland. Following input and feedback from the patients, the 2000 Steps literature was finalised. The 2000 Steps a Day walking pack consists of a pedometer, a leaflet about the benefits of walking as exercise for Lung Fibrosis patients, an inspiring poem featuring a contract for success, a diary to record the number of steps taken each day. The 2000 Steps a Day walking pack has been available to IPF patients since April 2013, but it was officially launched on June 5th in Fitzwilliam Square, Dublin. We had beautiful blue skies and bright sunshine as we gathered for the photo call. Our photographer Andres made everybody feel at ease as we smiled for the camera and had fun with various poses and props. Sincere thanks are extended to Senator Feargal Quinn and Michael Darragh MacAuley, who were incredibly generous with their time and so willing to lend their support to this exercise programme for Lung Fibrosis patients. Both men were most obliging and happy to join in the fun. Thanks also to our patients Eileen, Frank and Paddy who were so enthusiastic to be involved in the photo shoot. All three patients use the 2000 Steps a Day Programme to keep fit, mobile and healthy and all were wearing their pedometers on the day showing true commitment! 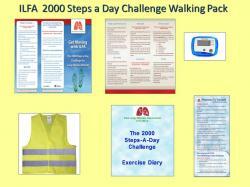 The 2000 Steps a Day walking pack is free of charge for Lung Fibrosis patients and can be ordered from ILFA by emailing info@ilfa.ie or by calling 086 057 0310. A small donation is requested in order to fund the programme. 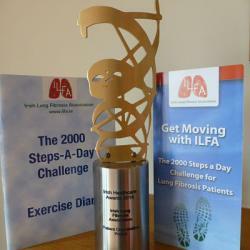 The ILFA 2000 Steps a Day Challenge for Lung Fibrosis Patients has won the 2014 Irish Healthcare Award for the Best Patient Organisation of the Year. Irene Byrne, Senior Physiotherapist from the Mater Hospital and Nicola Cassidy from ILFA, who jointly developed the exercise challenge, accepted the award at a dinner held in the Shelbourne Hotel, Dublin on 6th November. Everyone at ILFA is delighted and honoured that our home-based exercise programme specifically designed for lung fibrosis patients has been recognised with such a prestigious award. Thanks to everyone involved, especially the 15 patients who helped to pilot the exercise programme to assess its suitability and effectiveness. This special award is dedicated to the memory of Charles Lock, Denis Donaghy, John Glackin and Pat Casey who were instrumental in the development of the ILFA project and always enthusiastic and positive about the benefits of exercise for IPF patients.